An evening of post-punk and stoner metal with elements of 60's psych rock. Twin Lakes Records is launching CD singles for Myty Konkeror and Closely Watched Trains. . . free to the first 20 who pay the cover. 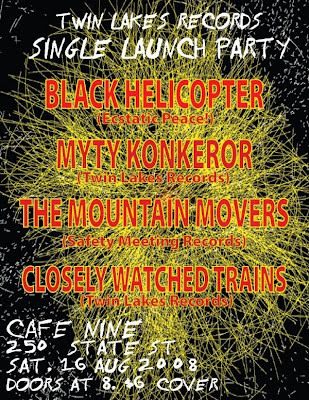 Boston's Black Helicopter (Ecstatic Peace) and New Haven's own The Mountain Movers are also on the bill.